Have you seen The Chronicles of Narnia? If so, then you will have been nearby before – in Aslin’s Camp. 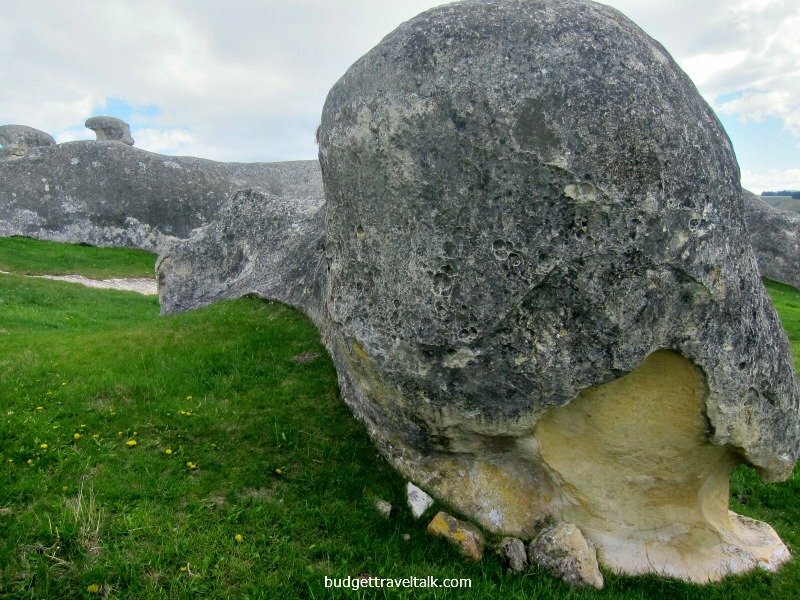 Once sand at the bottom of the ocean a mere 25 million years ago, then compressed into limestone, Elephant Rocks have been shaped by wind and water erosion into this mammoth collection. Elephant rocks are in Section 8 of the Alps to Ocean Bicycle Tour that begins at Mt. Cook and ends at Oamaru. This section from Duntroon to Oamaru takes 4 to 5 hours. Although the rocks are supposed to look like elephants, just use your imagination and they look like many different things. Look at that sky – are we going to get wet? 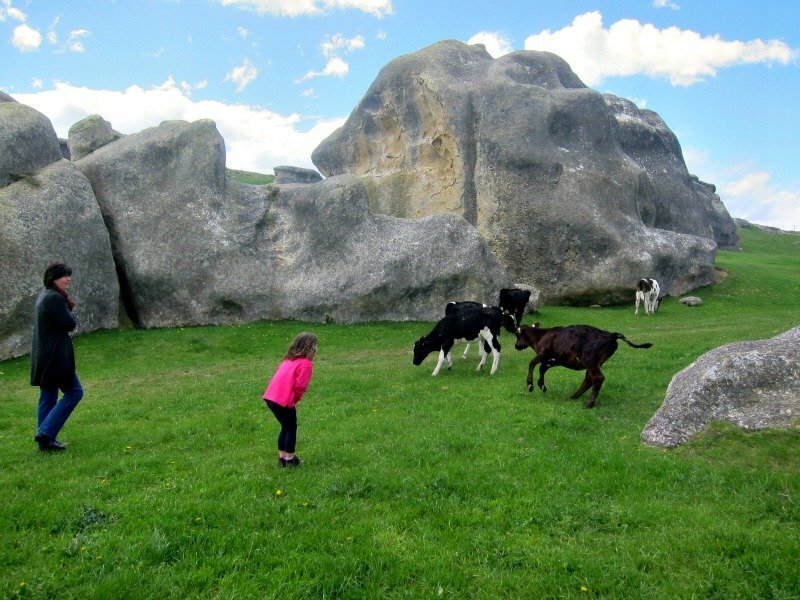 If you are wondering about the cattle, Elephant rocks are on private property, so it is important to take notice of any signed directions the farmer may have in place. The movie set built in a nearby field is for the Jesus movie Kingdom Come, meant to be filmed in 2009, but put on hold when the company experienced financial difficulties. It is rumoured the movie is going to be filmed in 2013 and the set is currently being checked for structural safety. 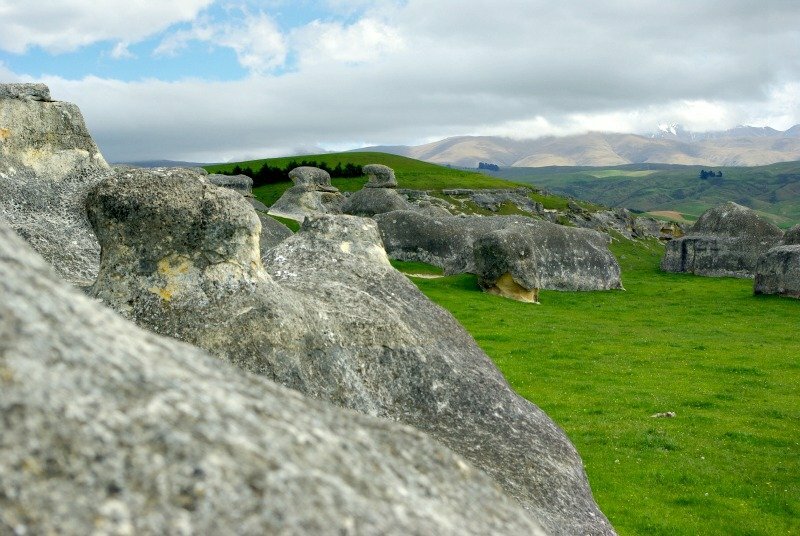 Visit the Vanished World display in Duntroon first, or the Information Centre in Oamaru, for more information. 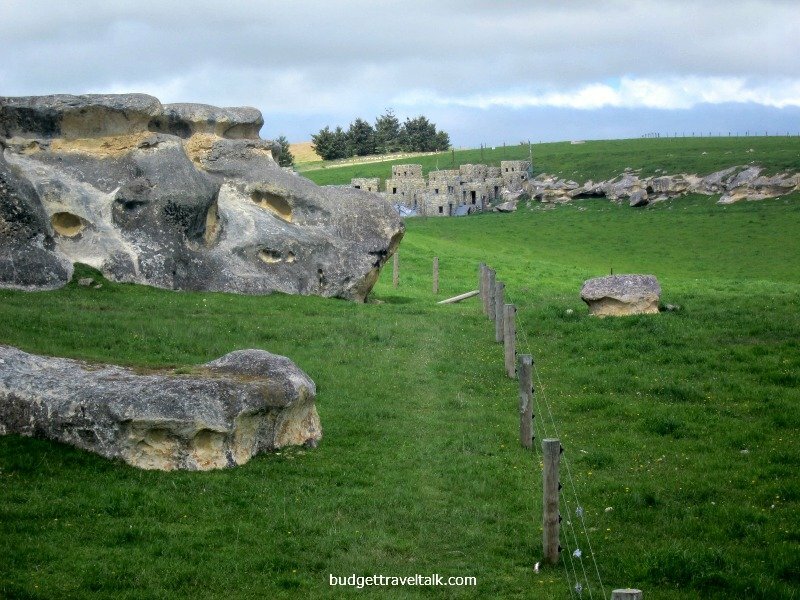 The direct route from Oamaru to Elephant rocks (near Duntroon) is a 40-minute drive on State Highway 83. 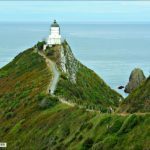 This is a family friendly attraction and an easy half day car trip from GUMTREE FARMSTAY in Oamaru. 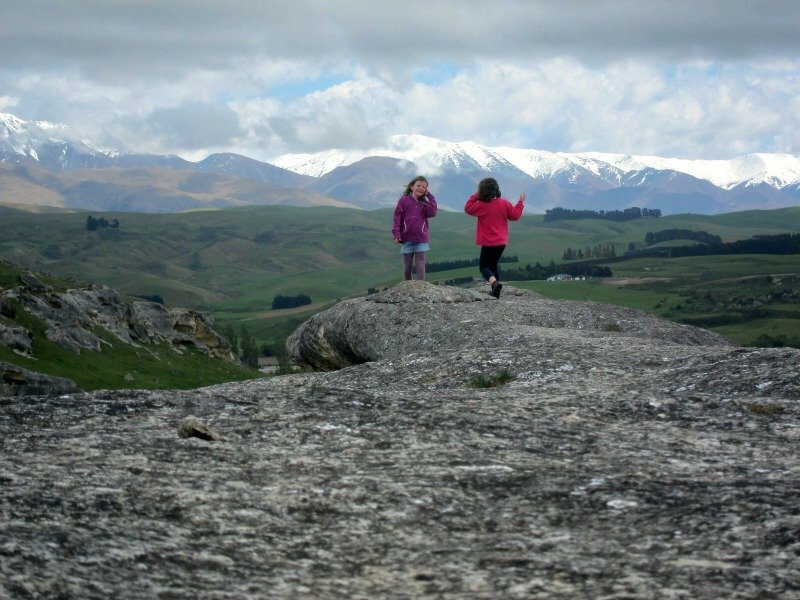 Pack a picnic and soak up the fantastic scenery and let the children and young at heart do a spot of bouldering. 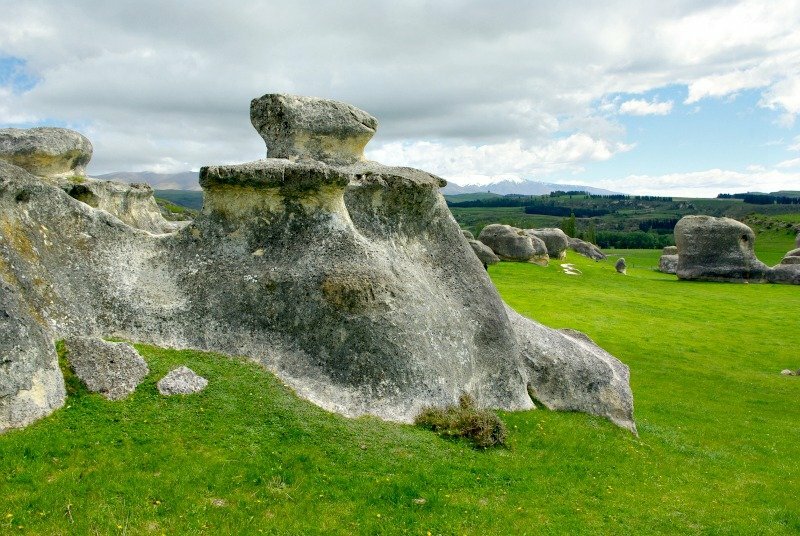 Another option would be to combine Elephant Rocks with the KUROW WINERY in the Waitaki Valley at the gateway to the high country. It’s limestone soils are comparable to those in Burgundy, France, with their signature wine being a Pinot Noir. The cafe is well known for good food and can be extremely busy, so it may be best to ring ahead. 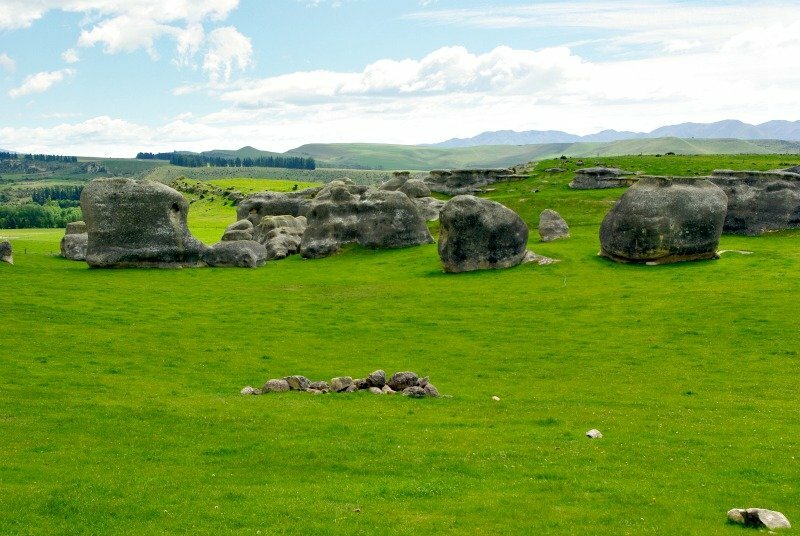 Rocks and Otago seem to go together. 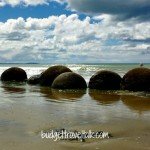 We also visited MOERAKI BOULDERS south of Omaru. 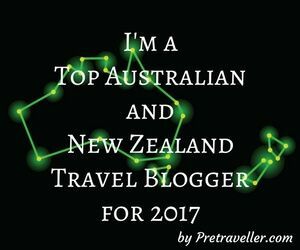 This post is linked to BUDGET TRAVELERS SANDBOX. That one shot of the kids on the rocks with the snow capped mountains in back is simply breathtaking. I think it’d be great fun to go here and figure out what the shapes look like to us. 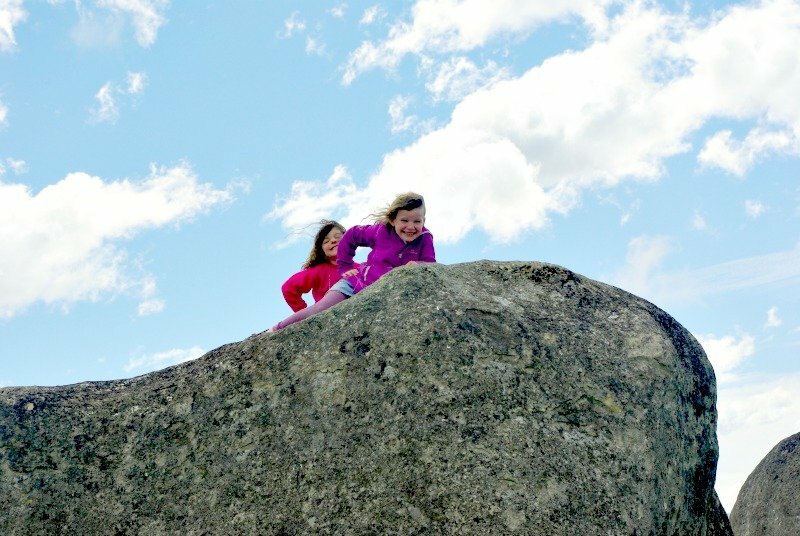 Yes Michele the kids would love it there, especially if they love climbing rocks! What an unusual landscape. Although, these rocks remind me of the Faroe Islands in the North Atlantic. Makes sense, perhaps, both near polar regions. Quite possibly Sophie, all I read about them said they were formed out of sediments in the ocean floor 25 million years ago. How fantastic that the farmer shares this treasure with others. 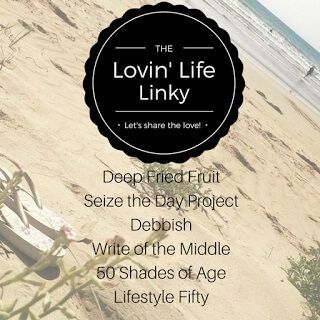 Fun photos here. I know Jackie. 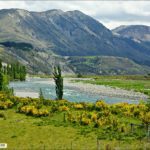 I think New Zealand (I have only been to the south island) has a Sixty’s or Seventy’s mindset – very friendly and easy going and open. I hope everyone does the right thing at Elephant Rocks so that the farmer continues to leave it open to the public. 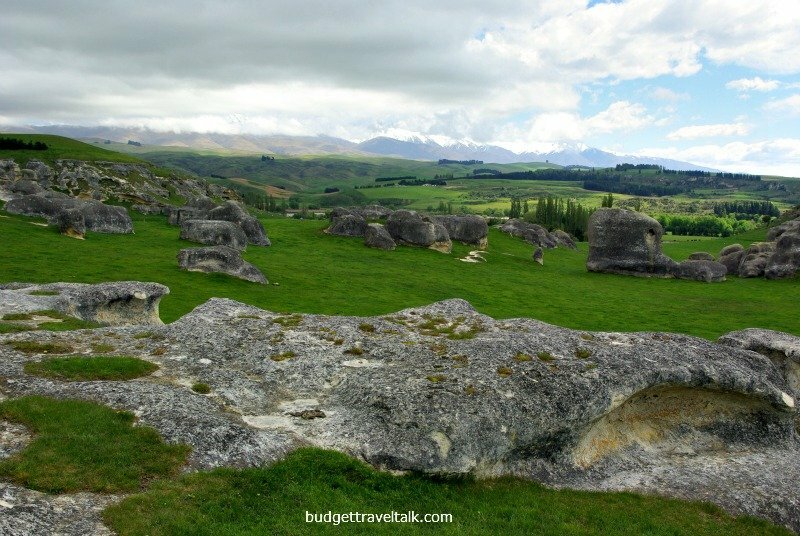 I had always wanted to visit NZ because of the LotR film sets, but I didn’t know the Narnian movies were shot here too. 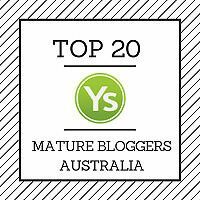 Another reason to go and visit! Such a wonderful country to make movies in! 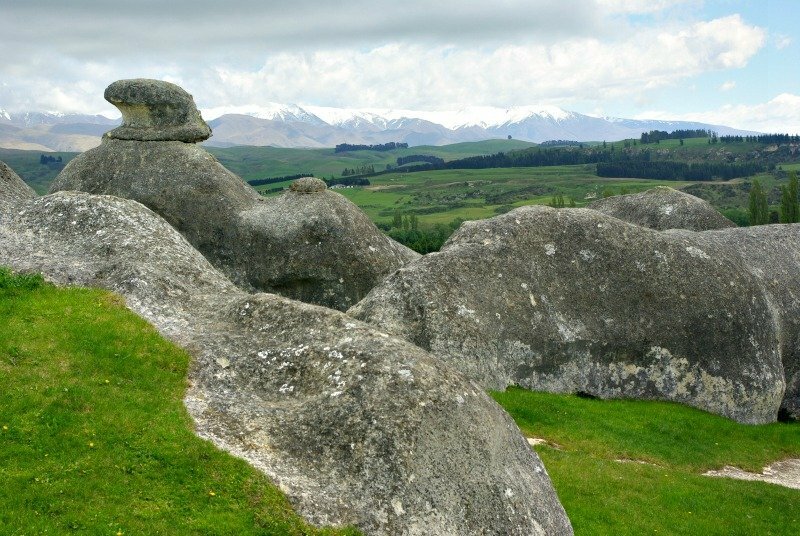 Despite spending 2 1/2 months in NZ I have never heard of the Elephant Rocks. They are a place I would definitely enjoy visiting and photographing. Happy New Year. 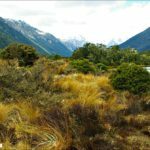 New Zealand is packed full of places to see and in such a small package. 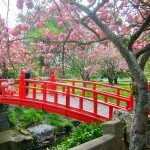 I think it is one of the best value places to visit. We were the only people there as well, but I bet it is popular in summer. Where did you spend most of you time, or did you travel continuously? 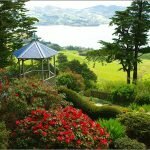 Did you visit during the NZ summer? It looks so green! I think I missed this part when I visited, but then again, it was during a frigid July so it could have been snow covered? We were in Oamaru for a week mid October, and it was cold most of the time. 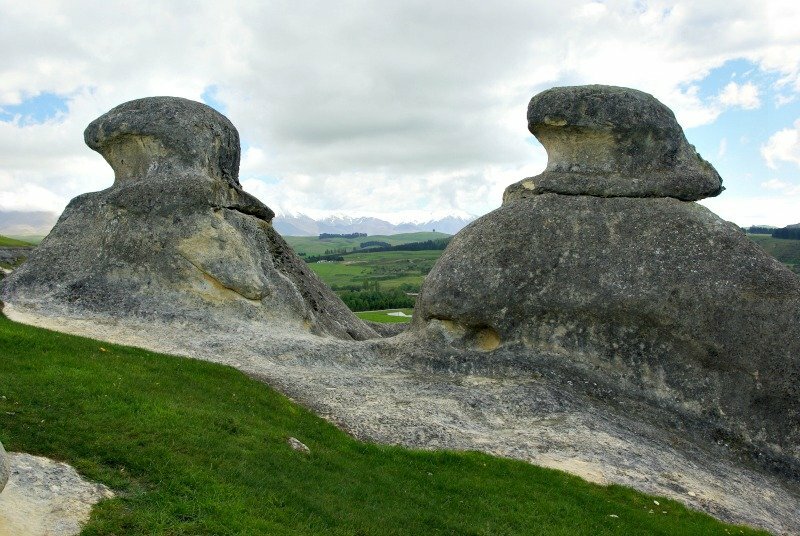 It would possibly snow at Elephant Rocks in Winter. Nature is truly amazing. Thx for sharing these shots of Elephant Rocks. Didn’t realize it was on private property. 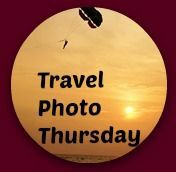 Lovely photos of a fantastic place! It’s hard to imagine that beautiful landscape under water. What an amazing place! I agree, it is totally amazing Josie. I wonder how the world will have changed in another 25 million years?